I have lived in Colorado for 20 years and I have never seen such a cold snap this early in the year. I’ve seen snow in July, weeks at a time of over 100 degrees, blizzards, hail and tornadoes but I can’t remember ever having minus double digits in December! For some reason the jet stream is coming down from the north and bringing us some arctic cold. The mountains have had better than minus 25 degrees and snow. Out here at the farm we have been between minus 5 and minus 15 at night for the last several days. It doesn’t look like it is supposed to warm up much until next Tuesday (4 days). I am continuing to work out the kinks on the watering system for the chickens. I must say first how resilient they are. As I write, I can hear one of the roosters out there crowing his fool head off. Just like my chicken bible said, they have figured out that heat rises and have been perched up on the higher rungs of the roosts all poofed up staying warm. It appears that our metal waterer with the heated base is winning the contest. 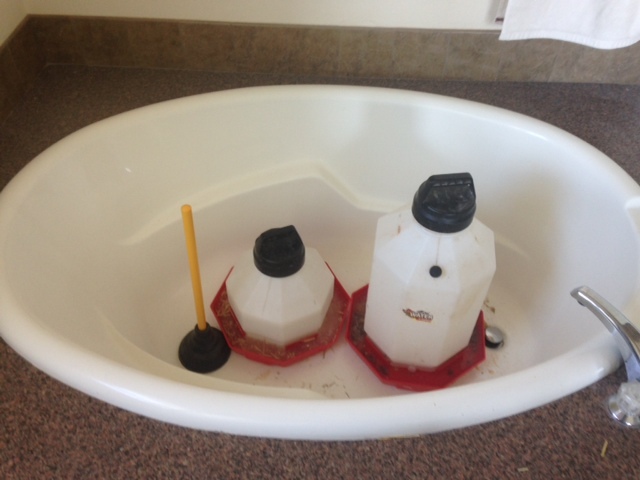 The heat lamps can keep the plastic waterers melted on the top but they aren’t strong enough to overcome the cold and keep the base, where the water comes out, thawed. The metal container, though, stayed thawed all night and when I went out this morning it was minus 7. It was likely several degrees colder earlier. So far so good. I will go out again this afternoon to check on it but it appears that it is the one that can withstand the cold. All of the others have done well until it reaches about plus 15. Sub-zero has just been too much. As the other waterers were ice bricks this morning I discovered a new use for the bathtub. Thawing. The taller of the waterers is 7 gallons. When solid it sure takes a considerable amount of time to warm it back up. Oh well, just another adventure. The birds are ok, the water issue is being handled, and its the weekend. All is going to be fine.